Allow me to begin with a confession: I’m never going to see 50 again (let alone 40) and accept that I am an irrelevant, bearded pedant, the archetypal old whisky bore ignored by whisky marketers and spurned for not being a New Appreciator, Confident Connector or Generation Whatever. All this despite actually having some disposable income which I’m prepared to spend on, for example, Diageo’s Special Releases. Every year. So what’s my gripe? It is the catastrophic overuse of the term ‘Masterclass’, emphatically with an upper-case ‘M’. Of course, whisky is replete with words which, through mindless repetition, have become meaningless; every hand-crafted release is a unique expression of the distiller’s passion and the brand’s heritage. Obvs. 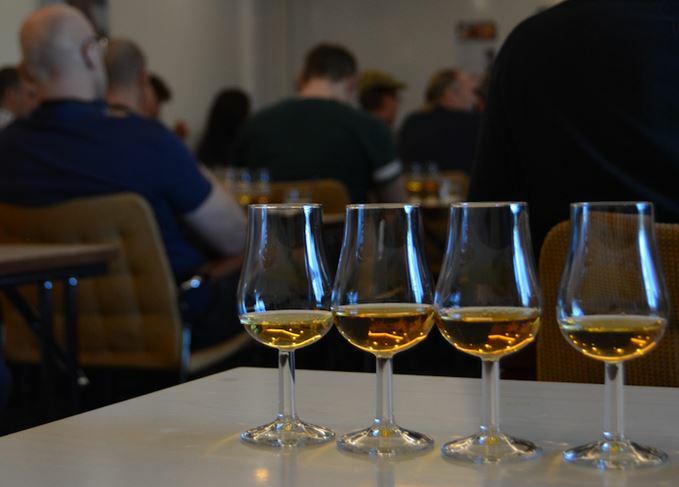 ‘Masterclass’, however, is apposite as we enter whisky festival season. To the ears of a grizzled and jaded old curmudgeon, it gives the impression of being ironic, that it must invariably be accompanied by the universally accepted gesture for inverted commas. I accept that language is a living thing; it changes, mutates and develops. Having teenage children is proof, were it needed, that this is seldom for the better. Vocabularies shrink and communication loses clarity. I take comfort in the fact that I’m not the only one who is unforgiving of errant apostrophes and considers grammar important. Back in the early days of whisky shows, at the turn of the century, the world was a different place. Chances are, dear reader, that you were still at school. There were no iPhones, no Facebook, no Twitter, no borderline illiterates calling themselves ‘independent whisky reviewers’. In 2003, you could go to a whisky show safe in the knowledge that the majority of stands would be booked by whisky producers or bottlers. There would be big companies and little companies, certainly, but not the plethora of rum distillers, purveyors of glassware, chocolatiers and so on (essentially anyone that can be convinced to accept a last-minute offer for a stand) you see at some events today. Better still, you could attend a Masterclass. A true Masterclass. The term conjures up – for me, at least – images of Daniel Barenboim coaching gifted and earnest pianists on the intricacies of Beethoven’s sonatas on the BBC in 1979. It was an appropriate title: watching Jim McEwan explain the glories of Islay, or Colin Scott deconstructing Chivas Regal 25 Year Old; enjoying a youthful Dr Bill Lumsden releasing the serpent; being shocked at the sight of Richard Paterson’s antics for the first time. He emptied an ice bucket on the floor! People who made whisky – or who had been at least immersed in the spirit for many years – talking about the making of whisky. In a recent blog post, Tim Forbes referred to these as The Genuine Articles, the masters of their craft, if you will. These people and a dozen or so like them had spent their careers making the stuff. It was an honour to meet them and a privilege to listen to them talk about their work and to taste with them. There is a danger that this will be perceived as yet another rose-tinted, ‘things were better in the past’ piece: jumpers for goalposts, direct-fired stills, etc. That’s not my objective. Nor is it anti-brand ambassador. There are many inspiring, creative and talented people gracing the industry today. I won’t embarrass anyone by naming names, but you know who you are, right? To be blunt: if I haven’t heard of you, it ain’t a Masterclass. Hyperbole to sell tickets? Perhaps. But don’t we all clamour for honesty and transparency in whisky (except, of course, regarding the identity of this contributor)? If so, exaggeration such as this is part of the problem. Another thing. If you are hosting a tasting, never refer to ‘my Masterclass’ on social media. Surely this is another example of things that people can say about you, but that you can’t say about yourself without appearing the opposite (see also ‘cool’, ‘handsome’, ‘great lover’, ‘expert’, etc). You are setting yourself up for a fall. Whisky attracts a special kind of person. Often they are so interested – obsessed, if you will – with detail that they might be on some form of spectrum. Sometimes these types take pleasure in exposing any shortcomings in the presenter’s knowledge. So, if there is any danger that an audience member is likely to know more about the subject than you do, don’t say you are hosting a ‘Masterclass’. Trust me. I’ve done it. The enigmatic director can teach us a thing or two about whisky tastings, says Richard Woodard.